RSMG Insights provide the data, insights and intelligence needed by clients in every area of sports marketing and sponsorship. They help clients to understand their consumers better, track the activities of competitors, optimize marketing and protect rights to make the best informed marketing and sponsorship decisions. ‘When we first met RSMG Insights, they were a holding company for a number of sports sponsorship marketing research brands around the world who each had fantastic attributes, skill sets and delivery mechanisms. Our first job was to look at the market and understand how to align their offer in a way that maintained both client and employee loyalty and created an offer that raised awareness, changed perceptions and delivered growth. As an agency, but more importantly as a group of individuals that consume sports and thereby sports sponsorship, we had to find the essence of what brought us together with the Brands, Rights holders, Broadcasters and Agencies who were the clients of RSMG Insights. We help clients reach their commercial objectives by providing the data, insights and intelligence they need in every area of sports marketing and sponsorship. We understand the DNA of the sports fan – what they hear and see, how they react, and how their behavior is changing over time. This knowledge is at the heart of making great marketing and sponsorship decisions in a crowded and increasingly costly market. The knowledge and analysis that we offer can help you know your customers better, track your competitors more effectively, optimize your marketing and make the best informed sponsorship choices. ‘Immaculate helped us to formulate and deliver a strategy that positioned our combined businesses. 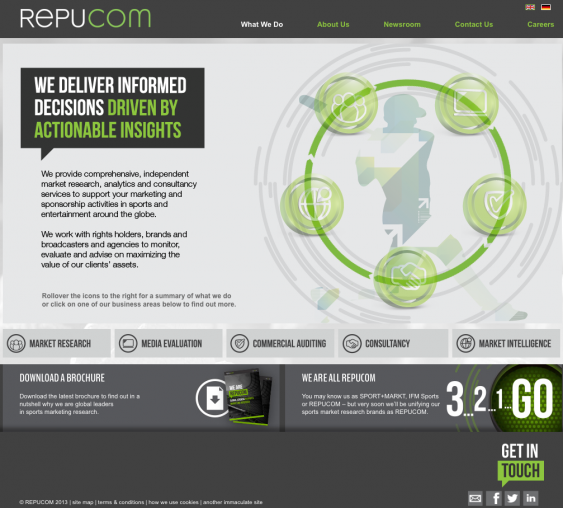 And as REPUCOM we offer a single, global source of independent market insights and consultancy. Our experts in more than 20 offices around the world monitor media, conduct market research, observe the activities and distil the opinions of fans every day to provide the knowledge you need to achieve value in marketing and sponsorship.